Moron. This "too" shall pass. FUCKED FO' LIFE. This man will not pass.... the 5th grade. When he got tis, he was constipated! ment to say "where is the hall pass"
Thank gawd, I thought this was permanent. He's actually a dedicated national park tour guide. The fail is the missing word, it should read "This way to Shall Pass". 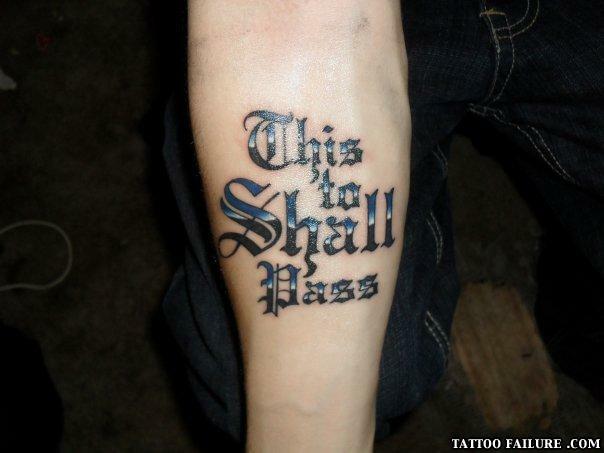 "Your wrong, it means "This to, SHALL pass" as In i will get by as well. Its a pretty commern saying over here." YOU'RE (=you are) an idiot! too = as well, to = direction, two = 2. I hope you get by better than your grasp of English grammar does. Good thing it's only his arm, had that been a spelling test he'd have failed! "This too shall pass" (Persian:این نیز بگذرد, een niz bogzarad, Hebrew: גם זה יעבור, gam zeh yaavor, Turkish: Bu da geçer) is a proverb indicating that all material conditions, positive or negative, are temporary. The phrase seems to have originated in the writings of the medieval Persian Sufi poets, and is often attached to a fable of a great king who is humbled by the simple words. Some versions of the fable, beginning with that of Attar of Nishapur, add the detail that the phrase is inscribed on a ring, which therefore has the ability to make the happy man sad and the sad man happy. Jewish folklore often describes Solomon as giving or receiving the phrase. The proverb and associated fable were popular in the first half of the 19th century, appearing in a collection of tales by the English poet Edward Fitzgerald and being employed in a speech by future American President Abraham Lincoln....................................................................................................................................You Sir Are TO a MORON!!!! All he needs to do is add "way" next to "this" and "ow" to "shall" to make "This way to Shallow Pass"...random, but not as idiotic.